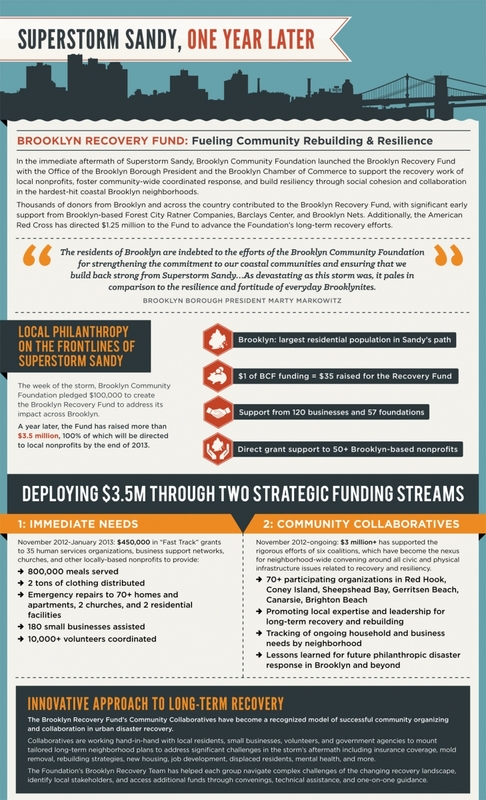 With over $3.5 million deployed to more than 100 community-based organizations to address recovery and rebuilding in the aftermath of Superstorm Sandy, the Brooklyn Recovery Fund has finalized its grantmaking operations as of January 31, 2014. 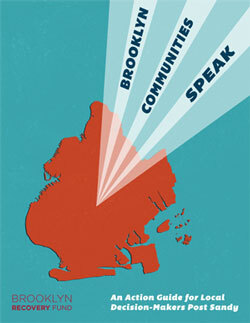 Established by the Brooklyn Community Foundation in partnership with the Office of the Brooklyn Borough President and Brooklyn Chamber of Commerce, over a 15-month period, the Fund provided three rounds of grants, fostered the creation of six Community Collaboratives, and advocated city-wide on behalf of impacted Brooklynites. Moving forward, Brooklyn Community Foundation will continue to support the Fund’s grantee partners through capacity-building assistance and resource dissemination, but will no longer fund recovery initiatives. Community Collaborative Grants: Established community-based collaboratives to coordinate immediate and long-term relief services to residents and economic recovery services to small businesses impacted by Superstorm Sandy. Community Rebuilding Grants: Supported physical improvements to homes and buildings located in Brooklyn’s coastal communities. 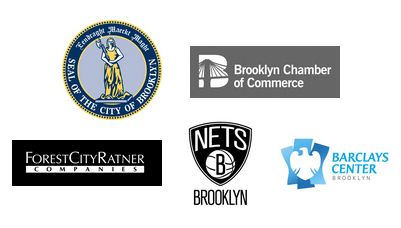 Emergency Fast-Track Grants: Provided short-term assistance to Brooklyn-based nonprofits and Brooklyn-serving nonprofits that work in communities directly impacted by Super Storm Sandy. The Canarsie Coalition, whose mission is to develop a recovery plan and facilitate recovery activities specific to Canarsie while simultaneously meeting the immediate needs of community residents, was established to provide collective voice for community organizations and residents impacted by Superstorm Sandy. Coalition members represent a variety of expertise relevant to local recovery and resiliency, including housing (Neighborhood Housing Services; Bridge Street Development Corp.), community development (Pratt Area Community Council), disaster case management (Catholic Charities Project Hope), youth empowerment (Informed Voices; Millennium), special needs and elderly support (My Time Inc.), and local Community Emergency Response Team (CERT). Previously, the Brooklyn Community Foundation awarded $200,000 to Neighborhood Housing Services of East Flatbush for the Canarsie Emergency Repairs Assistance Program, which provides 50 grants and forgivable loans (up to 10k for homeowners, and 25k for qualified building owners) for emergency repairs, mold removal/remediation, utilities equipment, and sheet rock installation. The Red Hook Coalition (RHC) is comprised of various community-based organizations and social service centers, with expertise ranging from disaster case management, to industrial development, to racial and economic justice. The RHC mission is to create an inspiring and practical vision for the entire Red Hook community that defines a clear path toward the community’s wellness and vitality, while facilitating a process to address long term challenges and impending disasters. Committed to the fulfillment of this mission are partners in sustainable development and youth leadership (Added Value), youth empowerment (Red Hook Initiative), youth development and disaster case management (Good Shepherd Services), recovery and volunteer management (Red Hook Volunteers), business recovery and revitalization (ReStore Red Hook), and local job creation (Southwest Brooklyn Industrial Development Corporation). Previously, RHC received a community-wide collaborative grant from the Brooklyn Community Foundation to allocate micro-grants to small businesses, meet immediate social service and food needs, and hire a coalition coordinator to build internal capacity and identify local employment opportunities. #ConeyRecovers is a collaborative initiative of several organizations working together to further the recovery of Coney Island in the aftermath of Superstorm Sandy, and build resiliency in the neighborhood. The initiative was founded by Alliance for Coney Island, a nonprofit organization whose mission is to promote “the People’s Playground” and improve the quality of life for the Coney Island community. Since the storm, #ConeyRecovers has played a vital role in the recovery of Coney Island, addressing both short-term and long-term needs through organizing volunteers, distributing supplies, serving as a central information resource, supporting local community-based organizations, and advocating for community needs. Partner organizations include Amethyst Women’s Project, Astella Development, Coney Island Community Council, Coney Island Generation Gap, Coney Island Hospital, C.I. Youth Alive, The HeartShare Surfside Gardens Cornerstone Program, Iglesia Pentecostal De Jesucristo “Cristo Viene”, Jewish Community Council of Greater Coney Island, New Church International, and Project Hope. Empower Sheepshead Recovery Coalition (ESRC) formed in response to Superstorm Sandy, and is committed to guiding the local community through recovery to meet desired outcomes. Their overarching mission is to bridge-build between macro and micro organizations, transition resources into local community pockets, involve the business community in long-term recovery, and enhance the preparedness of residents through advocacy, training, and education. Coalition members represent various civic, ethnic, and religious organizations, and lead partners include Kings Bay YM YWHA, Turkish Cultural Center, Chinese-American Community (TBD), Community Board 15, Jewish Community Relations Council, and Sheepshead Bites (local media blog). Previously, the Brooklyn Community Foundation awarded $100,000 to the Kings Bay YM YWCA to oversee a neighborhood-wide needs assessment in English, Turkish, Russian, and Chinese, and conduct outreach to local small businesses to inform and support the rebuilding pipeline. The Gerritsen Beach Long Term Recovery Project (GBLTRP) is a coalition of seven locally-focused charity organizations, focused on recovery and rebuilding in the aftermath of Superstorm Sandy. Lead organizations embody a range of expertise, including environmental cleanliness and social safety (Gerritsen Beach Cares), post-tragedy healing and physical reconstruction (HEART 9/11), foundational support for mold remediation and rebuild (Stephen Siller Tunnels to Towers Foundation), and mental health/disaster case management (Visiting Nurse Service; Project Hope). Previously, Gerritsen Beach Cares (fiscal conduit) received $200,000 from the Brooklyn Community Foundation to target 100 homes for mold removal and remediation in Gerritsen Beach, and rebuild the organization’s operational recovery headquarters. The Brighton Beach Housing Coalition, established to aid recovery along all housing-related issues in Brighton Beach, formed in the summer of 2013. The coalition is comprised of local nonprofits, community-based organizations, and community leaders dedicated to resolving the housing crisis exacerbated by Superstorm Sandy. The Brooklyn Recovery Fund recently funded this collaborative to support the early stages of coalition-building and ongoing recovery activities in the community. The coalition expects to include more than 50 organizations, meeting at least two times per month to develop a strong local voice in the affordable and sustainable housing arena.